Below you will find examples of bespoke built websites, websites built using the Squarespace platform and a selection of e-flyers. The Urban Therapy site is fully optimised to work beautifully on all platforms. This site features Parallax scrolling. The Admiral Hornblower site is fully optimised to work beautifully on all platforms. This site features Parallax scrolling and on-line booking. The A.R.T site is fully optimised to work beautifully on all platforms. A bespoke built site that is fully optimised to work beautifully on all platforms. The Angela Vickers Bridal Designs website is a bespoke built site, and is fully optimised to work beautifully on all platforms. 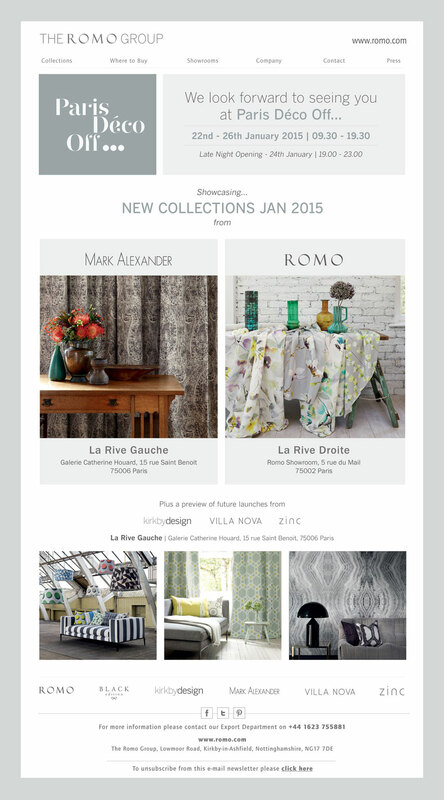 The slideshow below features a selection of e-flyers produced for ROMO Fabrics. All the designs feature built in navigation, with direct links to clients website. The slideshow below features a selection of e-flyers produced for Radford Accessories. All the designs feature built in navigation, with direct links to clients website.